Russia are busy working on their answer to the Boeing 737 MAX aircraft and are planning to debut their development this summer. The Irkut MC-21, complete with passenger interior, will be shown for the first time at the Moscow International Aviation and Space Salon (MAKS 2019), which runs from August 27th to September 1st this year. 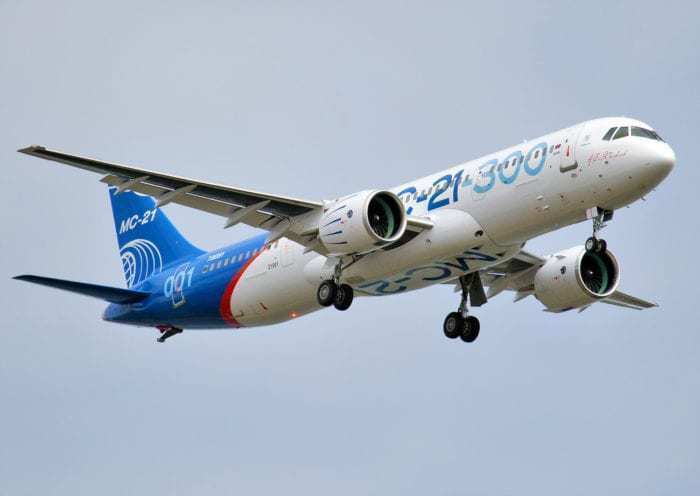 The launch of the MC-21 comes following Saturday’s third successful test flight for the aircraft. It is hoped that the airliner will receive certification in 2020. Produced by the United Aircraft Corporation (UAC), they have pegged it as a potential competitor to the 737 MAX. 16 марта 2019 года на аэродроме Иркутского авиационного завода состоялся первый полет третьего опытного самолета МС-21-300. The Irkut MC-21 is a single aisle jet which has been under development in Russia for over 12 years. Design began in 2006 with introduction slated for 2012. However, in 2011, the launch was delayed until 2020, and the first MC-21-300 was rolled out on June 8th, 2016. It took its first flight on 28th May 2017. Production of the aircraft has been further hampered by US sanctions, which have cut off access various products, in particular to composite wing materials. As a result, Russia has enough material to build just six more planes. They will need to create their own industry in composite materials if they are to begin mass production. Is it really a competitor to the 737 MAX? As the most popular aircraft in history, the 737 is well known to carriers and passengers everywhere. However, with recent issues seeing the modern iteration of the aircraft grounded, confidence in the line has certainly been shaken. However, despite Boeing’s current woes, it would take a mammoth effort to make a dent in their market share. And with stiff competition from the Airbus A320 family too, what hope does the MC-21 really have of breaking into the mass market? Let’s take a look at the aircraft and what it’s planning to bring to aviation. In comparison to the 737 MAX family, there are some striking similarities. Although the passenger capacity of the MC-21-200 is lower than any of the MAX aircraft, the MC-21-300 straddles the capacities of the MAX 8 and MAX 9 very neatly. The length of the two models, again, is a neat fit with the MAX 8 and MAX 9 respectively. However, where it really falls down is in its maximum takeoff weight (MTOW), which at 72,000kg for the smaller version is almost 8,000 kg less than the smallest of the MAX family. Even the larger MC-21-300 has a lower MTOW than the MAX 7, which could be a big deal for carriers looking to operate the aircraft. The success or failure of the MC-21 will come down to price and availability. UAC have indicated that they can only produce 10 MC-21s in the first year rising to 20 in the second, but will be reliant on a supply industry being developed locally in order to achieve this. As of the end of 2018, they had received 175 orders for the aircraft, including 50 from Aeroflot. Aeroflot had also ordered a number of 737 MAX aircraft for their low cost arm, Pobeda, but have been said to be mulling over cancellation as a result of the recent accidents. I think there are airlines in Russia, China, Africa, the Middle East and South America that would be willing to give this plane a try…especially seeing as it is slated to be substantially cheaper than a 737. Iran has already expressed interest, seeing as it can’t purchase Boeing or Airbus planes (due to sanctions). I think that a good Russian and / or Chinese aircraft should also be an alternative on occidental countries. Of course, safety is the factor number one, and the reliability will be important decision making criteria. But as we see with the B737 Max, as we saw with the B787, flaws are possible even in occidental planes, they can or they do endanger the passengers. One of the point that is sometimes used by occidental people that airliners from some countries are unsafe inherently is a bit ironic. We need to become more open-minded regarding China now. They are the most experienced industrials in so many fields now. There is now expertise in innovation as well, not only replication anymore. High speed trains start to be exported, and some American cities even ordered Chinese trains. At some point, if the Chinese planes and the Russian ones demonstrate high safety rates, good economics, and good reliability, they will be serious competitors to Airbus and Boeing, and it will even be the case for occidental airlines. so they start to sabotage American airplanes in hopes of better sales now? MC-21 will be fitted with Russian engines PD-14, but I don’t think that will be earlier than 2021. Nevertheless, after that this aircraft will be sellable, but unlikely in EU, USA, Canada, Australia and NZ. But Africa and big part of Asia are already a good market, that Boeing and Airbus will lose happily. So I think the barring of Russian made airplanes for sale in Iran for example by USA is a boomerang, that will hit back the US. It’s better to keep the American components manufacturers involved.